When members of Congress face a choice between voting for what they think is best for the country and voting with the views of their constituents, the public’s stance is that members should vote to represent their district, according to a new Pew Research Center poll conducted during the battle over the budget and debt ceiling. This view is particularly prevalent among Tea Party Republicans. Overall, 55% of the public says that members of Congress should vote against a bill that they think is in the best interest of the country, if a majority of the people they represent is against it; 38% say members should vote for such a bill. This balance of opinion hasn’t changed much since 1987, when CBS News and the New York Times first asked the question. Among Tea Party Republicans, fully 76% say members should vote against a bill their constituents oppose, even if he or she thinks it is in the best interest of the country. 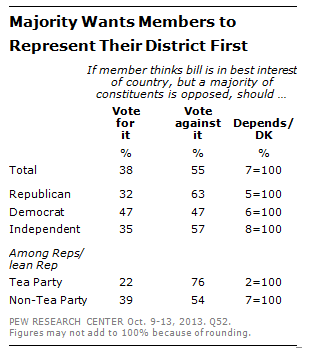 Just 22% say the lawmaker should prioritize the national interest above their constituents’ views. Democrats are more supportive of members using their own discretion, but even they are divided on this question: 47% say a member should vote for a bill they think is in the best interests of the country, even if majorities of the people they represent oppose the bill; an identical 47% say they should vote against the bill.